Paolo Cirio is a self-described sculptor of data, or what many others would consider a hacker. On his personal website there is a list of “Key Facts” which are essentially a resume of scams, web disruptions and media subversions that include things like “hacked and stole digital books from Amazon.com and redistributed them for free. The firm had to give embarrassing explanations to the press,” and to greater extremes, “created an online platform to debug the script of Security Theater, the PSYOPS program for antiterrorism measures in international airports.” Paolo is well-spoken about his projects, which is important when you’re trying to pass off the theft of 1 million Facebook profiles as “art”. He seems intelligent, maniacally creative, and has a bizarre, semi-destructive sense of humor. I like him. 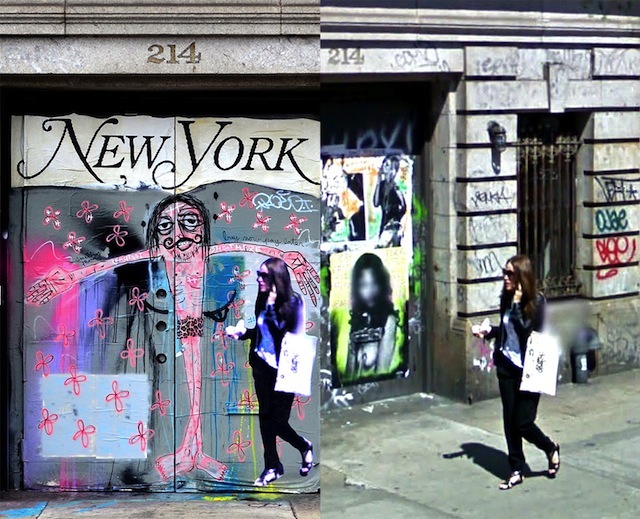 Why is he being talked about on a street art blog? 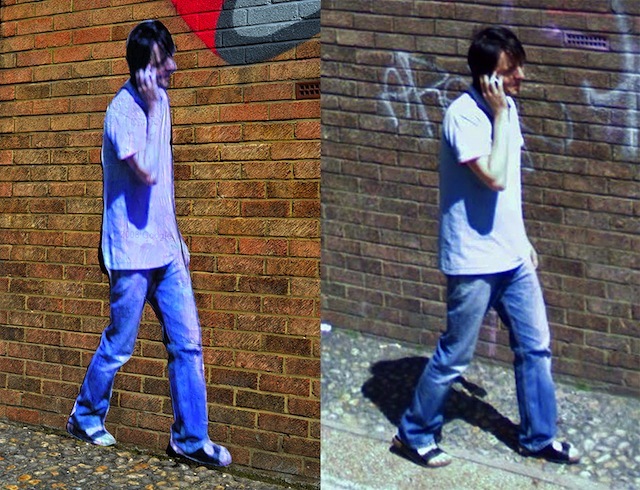 His online subversion recently made its way into the real world when he pasted life-size printouts of people caught of Google’s Street View camera in the precise location their images were taken. 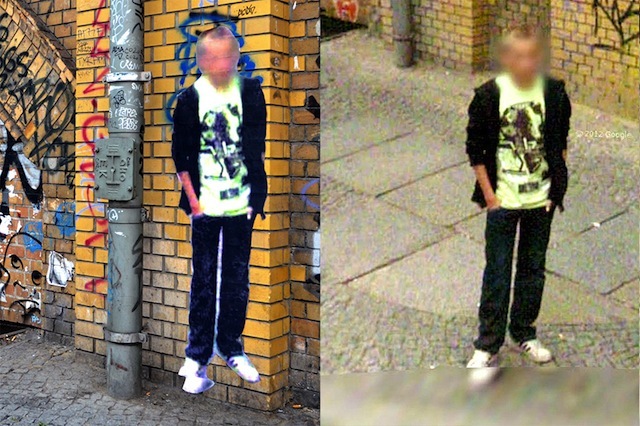 He has dozens of these “Street Ghosts” in three different cities: New York, London, and Berlin. “This ready-made artwork simply takes the information amassed by Google as material to be used for art, despite its copyrighted status and private source. 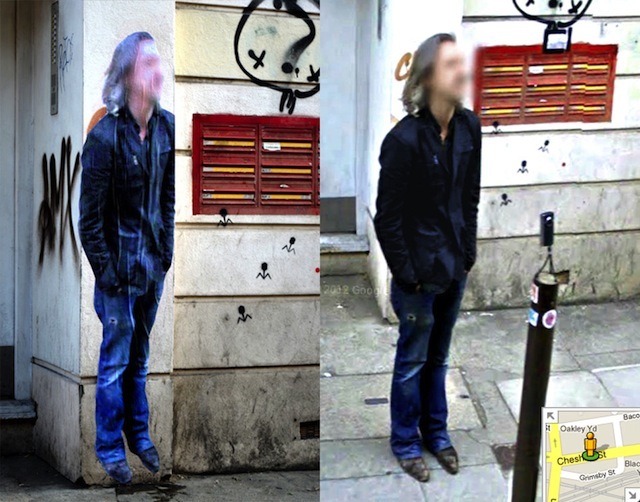 As the publicly accessible pictures are of individuals taken without their permission, I reversed the act: I took the pictures of individuals without Google’s permission and posted them on public walls,” says Paolo. For more photos and information on Street Ghosts go here.